“Here is Betty White – a woman who has been on television forever!” is generally how Betty White is introduced. And quite accurately, too, since she first appeared in 1949, when both she and television were rank beginners. Since then, she has had one of the most amazing careers in TV, winning five Emmy awards, creating such unforgettable characters as Sue Ann Nivens and Rose Nylund, and appearing in a host of television classics from 1952’s Life with Elizabeth to The Mary Tyler Moore Show and The Golden Girls. 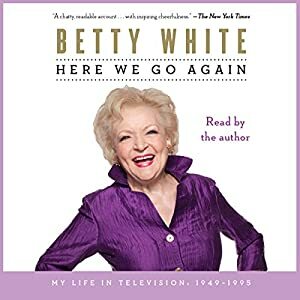 Here We Go Again gives an overview of television’s golden era, packed full of wonderful anecdotes about the many famous personalities with whom Betty has worked. It also gives a fascinating behind-the-scenes look at television over five decades, from her first show, Hollywood on Television, which ran live five and a half hours a day, six days a week (33 hours per week! ), to Betty’s current television work. In addition, she talks about her personal life – how her hectic career caused strain in her relationships and how she finally found happiness with her third husband, the late talk-show host Allen Ludden. As warm and funny as its author, Here We Go Again will thrill her many fans and delight all of those who are interested in the history of America’s most popular form of entertainment. Betty White is such an interesting person, how could this book be anything but interesting. I enjoyed learning things I didn’t know about her. She knows so many people in “the biz” and leads such an amazing life. I loved listening to her thoughts on making some of the decisions she made, her love for her family, friends, tv, Alan Ludden, and animals. I loved hearing her infectious laugh. This was a short listen but it’s pack full of wonderful stories. I think we need an update on what’s happened in her life since this book. I’m sure this was good! She is so funny! Very good, I learned so much about her that I didn’t know. Yes, I love Betty too. This sounds terrific! This is my first book by her. Now I want more. Big fan of Betty, a woman who makes everyone laugh including herself. I’ll have to check our library for this, it sounds good. I hope they have a copy. It is a really interesting book. Vicki, this sounds like a terrific audio book! I don’t know much about Betty White’s personal life. Great review! I didn’t know much about her personal life either, but learned a lot from this book. She’s had such an eclectic career. She’s gone from acting like the epitome of a ditzy blonde to roles in “The Golden Girls” to a woman who has some serious problems in “Lake Placid”. Love her work. I love her work too Sandra. She did a great job in Lake Placid, a very different kind of role for her. I don’t know anybody who doesn’t love Betty White! I’m showing my age but I remember when she was married to Allen Ludden, and Password! I was a kid but still…. I remember her on Password too Tina! I love Betty White. She’s been around forever and is funny as hell. We’re heading out on a long car trip in a couple of weeks and I think this would be perfect! Thanks for sharing, Vicki. You’re welcome Mary! I hope you enjoy it! Oh this sounds delightful! My library has an audio of something by her that I’ve been thinking about getting and it sounds like I really should. This sounds like a great pick me up! I love Betty and now I want to read more of her books. I hope you do get the book at your library, I’d like to see what it is and how you like it.